An airbrush is a precision instrument that applies many kinds of paint, colour or media to a surface using an air supply to propel the colour. It differs from a spray gun in as much as it is small and compact, measuring approximately 130-160 mm and is used for fine detail work in several art fields, including ceramics. Walker Ceramics supplies a Paasche Airbrush – recognized as one of the top names in the field. The Paasche Model “H” (Product Code RA10) is recommended for ceramics, being a single action model used for universal applications. The H single action allows the user to achieve fine lines down to 1/16 inch and wider patterns of up to 1-1/2 inches. The H is simple and easy to use and requires very little practice compared to double action models. The best uses are those requiring more basic spraying like solid coats, uniform lines or stencil work. Clean up is as simple as spraying your paint cleaner though the airbrush. 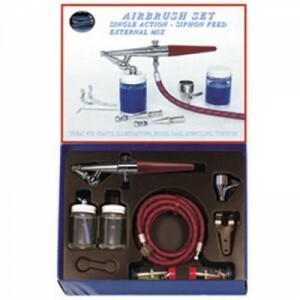 The H airbrush is made in the US and includes the following: H#3 airbrush, size 1 & 5 spray heads, 1/4oz metal cup, 1oz bottle assembly, 1oz storage bottle, hanger, wrench, six foot braided hose, lessons booklet and manual. Air pressure is recommended at 20-45 psi (138-310 kPa) depending on fluids being sprayed and the size of the air cap and colour adjuster. Air pressure is usually supplied by a compressor. Alternatives are cans of airbrush propellant, or a DB32 tyre valve, which connects the air hose to a spare tyre inflated to 35-50 psi (241-345 kPa). Jerky or fluttering spray Loose fluid tip, fluid needle, packing screw or fluid tube, worn needle packing, too little fluid in cup or tank, gun (with cup) tipped too far. Materials run or sag Liquid too thin, stroking gun too slowly, gun too close to work, fluid needle adjustment open too far. Excessive mist spray Too much air pressure for amount of liquid delivered to nozzle, spraying too far from work. Too small a spray pattern Insufficient fluid pressure, dirty air cap, lumpy material, incorrect fluid adjustment. Spattered spray Dirty air cap, thick liquid, low air pressure. Fluid leakage from air nozzle Fluid needle not seated, fluid needle packing screw over tight, dirty fluid tip. Materials fail to atomize Air pressure too low, blockage in air line or air passages in gun, liquid too thick. Unbalanced spray pattern Dirty air cap. Split spray pattern Too much air pressure.